On April 20, the Pritzker Legal Research Center launched its spring exhibit, We’ll See Them Through: Northwestern Prtizker School of Law in the World War I Era. The title is taken from former dean John Henry Wigmore’s 1917 score “We’ll See Them Through,” which was intended to bring support to those in the World War I training camps. 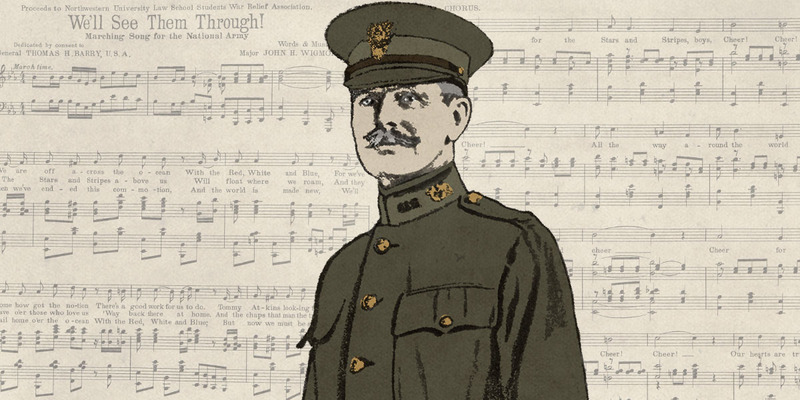 Wigmore—law professor, evidence expert, and sometimes musical composter—drafted the lyrics and music, and John Philip Sousa, who wrote “The Stars and Stripes Forever,” adapted it for army bands. Wigmore himself financed the song’s distribution, and it was met with mixed reviews. However, until last week, the song itself remained a bit of a mystery. While we had the score, we certainly did not have a piano (let alone a band!) to play it for us. However, thanks to a presentation by Andrew Bullen of the Illinois State Library, we were able to use a program called SharpEye to generate the audio. This may be the first time in nearly 100 years that this song has been heard. You can find the lyrics to “We’ll See Them Through”—and see the rest of the exhibit—at sites.northwestern.edu/plrcwwi.